Reports in France today imply that French under-17 international Francis Coquelin has signed for Arsenal from Stade Lavallois, although the news is yet to be confirmed. Coquelin was on trial at the club recently but had his time at the club cut short due to injury. However, he seemingly impressed the Arsenal coaching staff enough during his time at London Colney to be offered a permanent deal. He’s a promising midfielder and would most likely spend his first season at the club acclimatising to London and playing in the reserves. Earlier today,it was suggested that Coquelin could be part of a triple-swoop by Arsenal for French players. As well as Coquelin, Samir Nasri and Clement Chantome could both be heading to Emirates Stadium. The Nasri signing is the most talked about of the three and there were reports in French newspaper L’Equipe that he will sign today, although that looks far from the case. 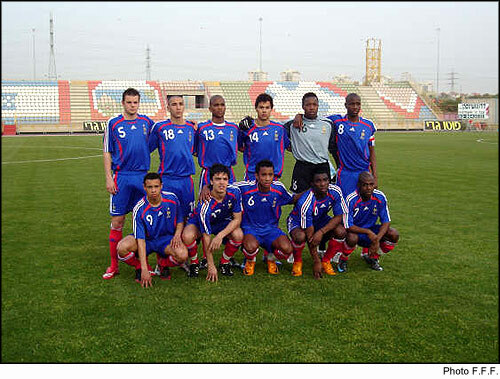 As for Chantome, he is a highly-rated 22 year old currently playing for PSG. In other transfer news, it appears that Manchester United have beaten us to the signings of Jeremy Helan and Darnel Situ. But you can’t sign everyone I suppose. 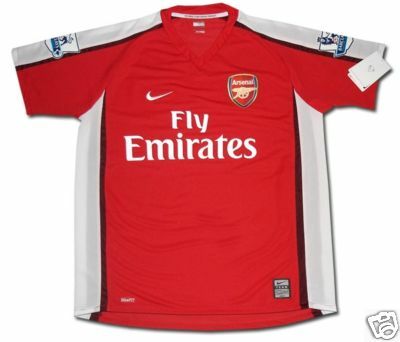 Finally, the picture above is of what is set to be Arsenal’s new home kit for next season. The kit will be worn by players at the club through all levels, from the first-team to the under-18s. The away kit will be based on the title winning strip of 1989. Are you sure thats the new Home kit? oh kl. who was wearing it? i dont think this jersey is good at all…………..it looks old!!!!!!!!!!!!!!!! Go to YouTube and type the words “Arsenal kit” in the search engine. Look for the most recently added results and you’ll see detailed pics of the new home shirt, plus a not-so-detailed pic of the 1989-esque away shirt. how could someone have been wearing it today? 1989 kit you sure? Looks more like the home kit used from 1998 – 2000. All we need to do now is make sure Nasri signs up too! WHERE THE FECK ARE THEY… ITS WINDY AT THE GROVE AND THE SHIRT HAS NO COLLAR…. i heard they gave out next seasons kit at the cesc fabregas show – thats probably how news got out. Good job Jeorge keep up the good work! It does look alot like the ‘Dreamcast’ shirt. I’m more excited about having an away shirt like the 89′ one though! Back to yellow – just how it should be. Why did you not reply to my comment mate? And you deleted it! No the audience from the Cesc Fabregas show will recieve their shirts when they come out in July…. Looks more like the 1997/98 shirt……….a double winning shirt!!! id like to see a collar as well. I bought a fantastic replica in China with the old crest and JVC on the front. It has a collar and looks superb. i suppose the players don’t want anything that keeps ’em hot. I’ll buy that away shirt though, no question! This kit doesn’t look so nice!The home kit which we worn during the 2005-06 season was superb! This shirt looks 20 years out of date and the sort you would expct a non league side to buy. This is the ARSENAL we are talking about not Cambridge United. the audience on Cesc show won the AWAY kit . and there were pics of both released a while ago …. i have the picture of both home and away kits ….. how can i post it on here ? ?or i can email it ? Which kit? the top pic or the bottom pic? anyone know what colour the socks are? Well I think it looks fantastic. And splendid that it has a retro Arsenal look, I prefer it that way. If we are bringing back the 89 style away shirt, even better!